Dr. Frederick H. Hanselmann ("Fritz") is an underwater archaeologist and Faculty in the Department of Marine Ecosystems and Society and part of the Exploration Sciences Program at the Rosenstiel School of Marine and Atmospheric Sciences at the University of Miami, where he directs the Underwater Archaeology Program. Having worked on underwater sites from a wide variety of time periods, his exploration and research ranges from submerged prehistoric deposits in springs and caves to historic shipwrecks in Latin America and the Caribbean, including the wreck of the Quedagh Merchant, abandoned by Captain Kidd in 1699 off the coast of Hispaniola. Fritz led the first-ever archaeological survey off the mouth of the Chagres River in Panama and directed the Río Chagres Maritime Landscape Study as well as the Lost Ships of Henry Morgan Project. He is one of the principal investigators of the Monterrey Shipwreck Project, exploring and investigating early 19th century shipwrecks 4,500 feet deep in the Gulf of Mexico. He was also the co-director of the Sunken Ships of Colombia Project and the principal investigator of the Spring Lake Underwater Archaeology Project. He is also the co-director of the Lost Ships of Cortés Project in Mexico. Fritz also focuses on capacity building and training for archaeologists and heritage managers in less developed countries, as well as the development of marine protected areas and underwater preserves. He is a cave and technical diver, a certified scuba instructor, a Nautical Archaeology Society Tutor, and a Fellow of the Explorer’s Club. He is also a Fellow of the Meadows Center for Water and the Environment at Texas State University. He has been widely featured in global print and electronic media, including documentaries, films, and programs with the National Geographic Channel, the Sundance Film Festival, the Sundance Channel, South By Southwest Film Festival, and the Travel Channel among others. 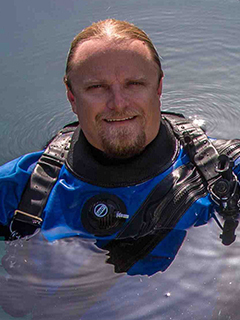 Fritz regularly gives public lectures and presentations for museums, universities, and other organizations and occasionally blogs for the National Geographic Explorer’s Journal online.